I am a morning person. I love to wake up early, shuffle down to the kitchen and pour a cup of coffee that is already made because I prepped the night before. I sit in a dark corner with a small light and read a book or sleepily scroll through my social media accounts. Mornings are good. It’s not always easy to get out of bed but my days are always better when I do. When I start my days with brain breaks, everything else seems to fall into place. This week is different. This week I’ve been going to bed by 9pm and still can’t drag myself out of bed until I’ve been in it for a minimum of ten hours. I am slow. I am groggy. I am physically exhausted. This week has also been a busy one with work, kids’ sports, appointments (and oh yeah no school) and I promise I am trying to be gracious with myself. I keep reminding my active mind that my body needs to take it easy for a few days. They seem to be at war with each other. I mentioned on my Facebook live last week that summer fills me with inspiration. My mind is ignited by sunshine and warmth and I want to run full steam ahead into my next project. However, the timing says differently and my body takes over saying not so fast, pace yourself. It’s a frustrating tension to exist in, especially after a long period of creative dormancy. I know there is a lot of pushback against “being busy” and I get the general idea. We shouldn’t use busy as a crutch to keep us from truly living. Life in balance can be busy without being overwhelming, but only if you do it right, say the experts. But sometimes doing it right is letting your body win. Accepting the shortcomings that a busy season brings and remembering the why behind it. My active mind is really at fault here. I thrive on information and planning and projects and we have a lot of that in the works. We’re making some improvements to the house later this summer, I’m launching a course, we have the boys in baseball now and later swimming. These are all good things that we enjoy and do because we want to. We’re in it for the right reasons. But when I lean into exciting ideas, my brain decides now is the best time for more exciting ideas! Depending on the day, this can be wonderful or debilitating. Today, my goal is focus. I’m big into lists and timelines and one of the hardest things for me to do is stick to the order of life. I like jumping around and picking out the fun stuff. I mean, who doesn’t? But right now, this summer, it’s more important than ever that I stay in my lane and stop cutting in line. It will be better for all of us. Today I slept 2.5 hours later than I wanted to. I might do that tomorrow too. Or maybe tomorrow will be the day I finally wake up feeling rested. I won’t know until I get there. Today, I don’t care about doing it right. I just want to make some progress, take a few steps forward and be gracious with myself. 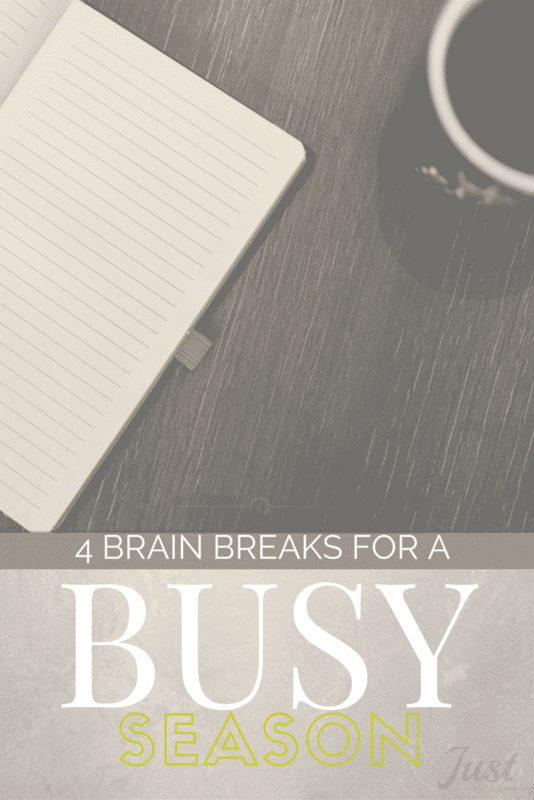 Here’s how I plan to use brain breaks to help me do it. Every time I sit up straight and pull my shoulder blades together behind me, it’s like someone is bringing my dead body back to life. It’s the most wonderful feeling when you sit at a desk for much of the day. Try it right now. I have quite a bit of laundry to fold. I know this sounds like staying busy but folding actually takes me out of my head for a few minutes. No tv, no music, just folding. Whether it’s folding towels or staring at the wall, let your mind step away from the activity for a few minutes. This is one of the benefits of being a work-at-home mom when the kids are out of school. Calvin is really into snuggling right now and snuggle breaks are a great way to spend 10 minutes, really any time ever. If you don’t have an adorable 5-year old to snuggle with, don’t fret! A power nap will work just fine. Breaks are good but my list is long. I’ll consider it a successful day if I can check off my top three to-dos. If I can do more, great! If not, tomorrow is another day. It’s important to remember that it’s not always going to be a reach for the stars kind of day and it’s equally important to make sure you don’t feel guilty when you’re in that place. My guess is you do way more than you think you do. I know it’s true for me. Sometimes, we just need a little reminder. What are your favorite ways to find rest when life gets busy?